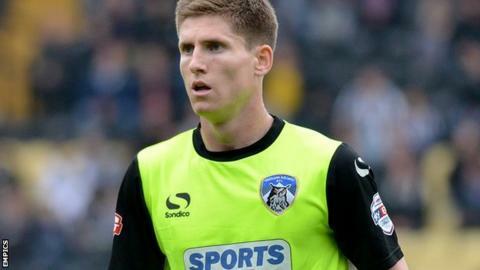 Danny Philliskirk's second goal of the season gave Oldham victory over Fleetwood. The visitors should have taken an early lead but skipper Antoni Sarcevic sent a close-range volley over the crossbar. The Latics went in front when Rhys Turner flicked on a long ball and Philliskirk finished from 12 yards out. Lee Croft could have made it more comfortable but missed the target from four yards before home goalkeeper Joel Coleman denied Danny Andrew. "The guys conducted themselves tremendously. They battled hard against a good Fleetwood side. "It wasn't our best performance but we won. There are games we've played superbly but haven't won. "I'm absolutely chuffed and delighted with the battling effort of the team. "The best start you want is six points from two games and I'll take four points from six any day." Match ends, Oldham Athletic 1, Fleetwood Town 0. Second Half ends, Oldham Athletic 1, Fleetwood Town 0. Attempt saved. Antoni Sarcevic (Fleetwood Town) right footed shot from the left side of the box is saved in the centre of the goal. Corner, Fleetwood Town. Conceded by Connor Brown. Attempt saved. David Ball (Fleetwood Town) header from the centre of the box is saved in the top centre of the goal. Substitution, Fleetwood Town. Nathan Pond replaces Bobby Grant. Corner, Fleetwood Town. Conceded by Lee Croft. Nathan Pond (Fleetwood Town) wins a free kick on the right wing. Attempt blocked. Jonathan Forte (Oldham Athletic) right footed shot from the centre of the box is blocked. Substitution, Oldham Athletic. David Dunn replaces Rhys Turner. Corner, Oldham Athletic. Conceded by Eggert Jónsson. Corner, Oldham Athletic. Conceded by Danny Andrew. Jimmy Ryan (Fleetwood Town) is shown the yellow card for a bad foul. Foul by Jimmy Ryan (Fleetwood Town). Eggert Jónsson (Fleetwood Town) is shown the yellow card for hand ball. Hand ball by Eggert Jónsson (Fleetwood Town). Foul by Danny Andrew (Fleetwood Town). Lee Croft (Oldham Athletic) wins a free kick on the left wing. Jonathan Burn (Oldham Athletic) wins a free kick in the attacking half. Substitution, Oldham Athletic. Jonathan Forte replaces Dominic Poleon. Antoni Sarcevic (Fleetwood Town) wins a free kick on the left wing. Foul by Dominic Poleon (Oldham Athletic). Substitution, Fleetwood Town. David Ball replaces Declan McManus. Attempt missed. Stephen Jordan (Fleetwood Town) header from the left side of the six yard box is high and wide to the left. Corner, Fleetwood Town. Conceded by Joel Coleman. Attempt saved. Danny Andrew (Fleetwood Town) left footed shot from the centre of the box is saved in the bottom left corner. Corner, Fleetwood Town. Conceded by Jonathan Burn. Attempt saved. Bobby Grant (Fleetwood Town) right footed shot from outside the box is saved in the centre of the goal. Hand ball by Michael Jones (Oldham Athletic). Foul by Jamille Matt (Fleetwood Town). Michael Jones (Oldham Athletic) wins a free kick in the attacking half. Attempt saved. Liam Kelly (Oldham Athletic) right footed shot from outside the box is saved in the centre of the goal.